Our 15U Black Venom boys continue their winning ways south of the border. Over the weekend, they competed at the 2015 Rochester Can-Am Bid Qualifier. The top 3 teams earned berths to the 2015 USA National Championships later this year. During two days of Pool Play, Black Venom romped over their U.S. counterparts including teams from Richmond VBC, Rochester Pace Bootleggers Red, Victor VBC, Eden VBC and Lockport VBC. The playoffs started with some apprehension against Panthers Gold in the quarter-finals. Despite a lot of unforced errors, Black Venom managed to pull it together at critical junctures to sweep the match 2-0 (25-17, 25-23). The semi-final match pitted Black Venom against the tournament host and #1 seed, Rochester Pace Bootleggers Black. Pace Bootleggers Black fielded some really big, hard-hitting front-court players. But we managed to hold our own at the net, and our ball-handling skills (setting, passing and defense) and unstoppable middle attacks were clearly the difference in the two-set win (25-13, 25-13). For the finals, we faced off against the KW Predators. How ironic? 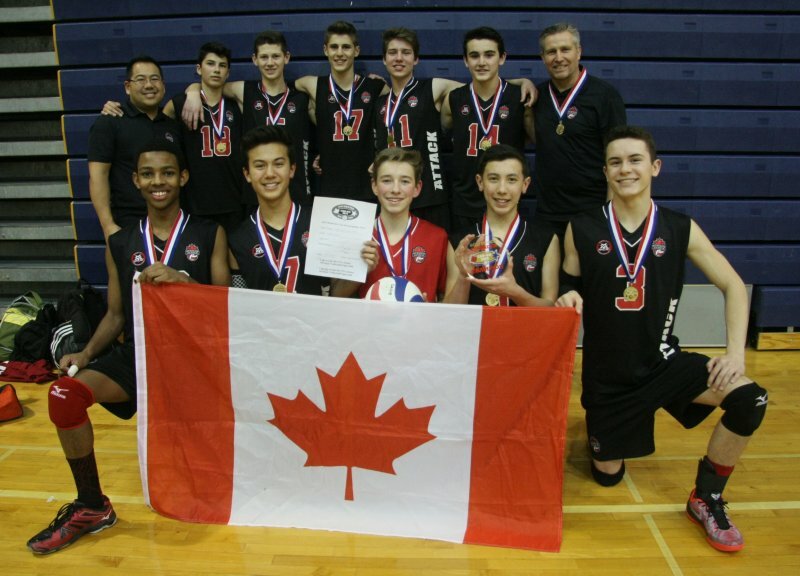 Two Canadian teams competing for the championship in a U.S. tournament. Our boys appeared more fresh and prepared for the finals. We played with a relaxed focus, controlled the tempo and swept the match 2-0 (25-18, 25-15).